If passed, California's Proposition 23 would suspend the state’s Global Warming Solutions Act (AB 32) until in-state unemployment drops to 5.5 percent or less for a full year, and significantly curtail development of the state's cleantech industries. 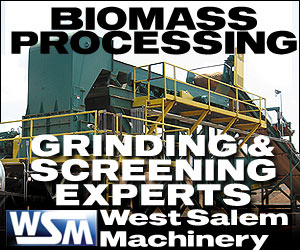 Finding much-needed capital to build a biomass project can be daunting task. At the Pacific West Biomass Conference & Trade Show, industry experts will explain how leveraging available state and federal tax incentives could fill that void. The Washington Department of Ecology has given Port Townsend Paper Corp. in Port Townsend, Wash., the go ahead to upgrade a boiler at its mill to run on waste wood, including some forest biomass. The project will generate 25 megawatts of electricity. Utilities have much to consider when replacing some or all of their base load power generation with biomass. Explore your fuel and boiler system options with industry experts at the Southeast Biomass Conference & Trade Show Nov. 2-4 in Atlanta. Nexterra Systems Corp. has received the results from a third-party emissions test indicating that Nexterra’s biomass gasification facilities produce “best in class” air emissions when compared with conventional biomass combustion technologies. INEOS Bio has secured air and wetlands permits, along with other key documentation and is on track to complete its Florida-based BioEnergy Center by 2012. The biomass facility will produce 6 megawatts of electricity and 8 million gallons of ethanol. DTE Energy Services has completed the conversion of a coal-fired power station in Cassville, Wis., to biomass, and the University of Wisconsin-Madison has broken ground on the transformation of its Charter Street Heating Plant from coal to biomass. The USDA’s BCAP final rule announced last week by Secretary Tom Vilsack adopted an approach on the critical issue of matching payments designed to minimize distortions to the market for wood fiber that is essential for the forest products industry.